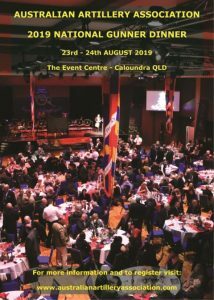 The Australian Artillery Association is again holding the National Gunner Dinner in 2019 to be held in Caloundra on the Sunshine coast. Happy Hour will be Friday 23 August with the main dinner being Saturday 24 August 2019. For FULL details, costs and activities etc, please refer to the Aust Artillery Assoc webpage.